Flickr has decided to cooperate with me for a little while, so I get to share with you some of my recent fun after all! I came across this beautiful novelty yarn in a shop sometime mid-last week. 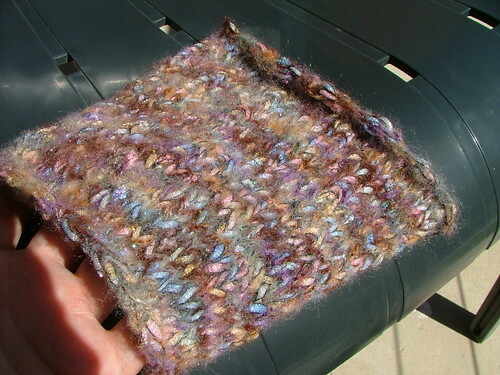 It's thick and thin with ribboning and mohair and very glitzy tinsel throughout. It's -fairly- annoying to knit up together since there's lots of little knots and bumps where the broad ribbon meets the thin mohair, but on size 10.5 needles it knits up into a fairly nice fabric! Isn't it pretty? Why I made bunnies! Of course! 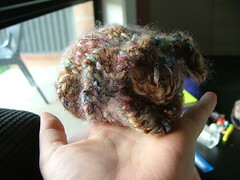 So for this bunny I knit 25 stitches with US 10.5 needles until it was square. Then the rest of the bunny is simply assembly; similar to origami in how you fold and sew edges together until it looks like a bunny! Knit up two quick ears and he's done! So cute! I finished him in two hours, maybe less. And have I mentioned that he's CUTE? 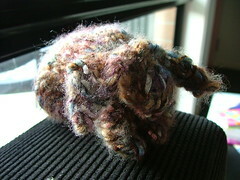 I've knit up another one up here at Emerald Beach and I plan on giving them to my nieces for Easter. I might even have enough yarn left to make a third! 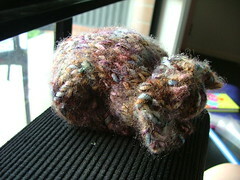 If you ever find a pattern for a knit rattie, I'd pay you to make me one! Also, you'd be so proud, I did color changing! 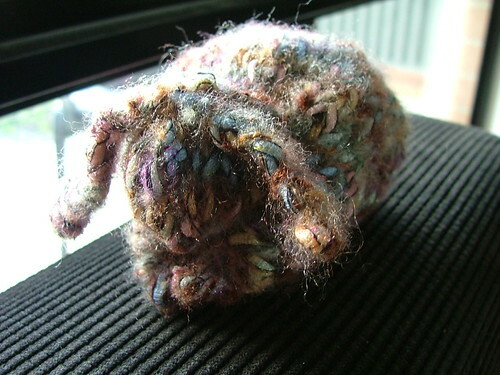 I was healing up from my tubal surgery and bored, so I grabbed some small half balls of homespun and knit Mollycat a little striped scarf (I'm a dork). I've got photos of her wearing it I'm going to post to my LJ. Plus, I've finished a scarf for my Nana and am working on one for my dad.